The only payment method guaranteeing 100% accepted transactions. Processing already more than $100,000 monthly? Compliant with the relevant legal requirements in the country of registration? Providing legitimate service with respect to KYC and customer service standards? 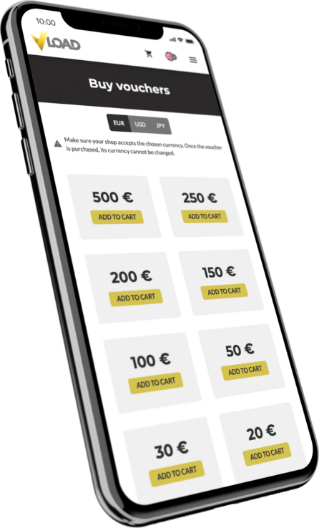 VLoad eVoucher eases your customers’ experience at checkout, giving them from the beginning 100% guarantee that the payment will be successful and instant. Your clients proceed assured, knowing they will be able to finalize the deal. VLoad makes it equally easy to pay on a local & international market. Open your business to new markets and increase the conversion rate at the payment page. Should a user require a voucher in a denomination different than standard, he may purchase a VLoad Bundled Voucher for the amount generated at your website or equal to his shopping cart total (rounded off to ten). Merchants meeting the criteria are qualified for VIP boarding. Get the paperwork ready and technical integration finished in 3-5 days. VLoad eVoucher is provided by an award-winning, international Payment Service Provider - Global Primex. Besides VLoad eVoucher, the company offers a wide range of alternative and diversified global payment options.